It was an ordinary day. I was sitting on a bench, waiting for my friend so we can grab a coffee. I was early, she was late... As usual. All of a sudden he turned right in front of me. He was a stranger, a tourist asking me if I can go with him to the fortress. He didn't know the way. It was weird because tourists usually show you the map and ask for directions. No. He wanted me to come along. There was something special about him. Something weird with his approach. It felt like I should meet him that very moment, not my friend. It felt like I knew him from a long time ago, like we're seeing each other on a daily basis. My mind was gone within seconds and I walked with him to the fortress. Conversation was so pleasent and relaxing. We talked about everything and we agreed on everything. When I talked he payed so much attention like those were the most important words in the world in that moment. And just like that... Our relationship started. We both knew that soon he's going back to his country but we weren't thinking about that. It was all about us and having beautiful moments together. We truly did. I will never have enough words to describe how he made me feel. It felt like we were in that relationship for years. We knew each other so well, no one could ever tell that we met just few weeks ago. Everything that I ever believed in about love I went through with him. I don't like the modern kind of relationships based on desires. With him it was entirely different. We could sit for hours and talk about music, movies, art history, architecture, photography... We could sit for hours in silence and it wouldn't be uncomfortable. I never felt so comfortable and safe with anyone, ever. I always think that we enjoyed that time together because we knew it was our time. Time just for ourselves. It felt like that was a chance we shouldn't miss. I haven't figured out why but it just felt like that. At some point I was talking to him about that and how all of that feels incredible and he agreed with me. We met on that same place where everything started the night before he was leaving. I wasn't sad at all. It was like a normal night out. We both knew he was leaving but somehow it wasn't sad. We just accepted that fact and we were both happy that we had managed to spend time toghether. I remember when it was time to go he said: "Always." and we both started laughing because we hate cliches. And because we both knew there's no 'always' for us. It was just that one time and we should be grateful because it happened. Because WE happened. From time to time, you cross my mind. Many things remind me of you... some music from the East or an Arctic Monkeys song. Sometimes you cross my mind when I walk down the square and always when I walk down the street where you kissed me for the first time. You know, my friends always asked me to explain to them what you mean to me. It's surprising to them how someone could have so much of my attention, like you. How could someone so quickly become someone so special to me? They know me. They know that doesn't happen so easily with me. But you did it. I leave them without an answer because I can't explain it to myself either. They always say that I still love you. But that's not true. I don't love you... not like that. I stopped trying to find a definition of you. But then something happened. With him, she had a feeling like their relationship had ended sometime in the past and now they have an opportunity to enjoy their love here and now in the present. Just for a moment. They're not part of each other's lives in this era, but that doesn't matter because they belong to each other. It's wonderful that they were lucky enough to have that opportunity to share moments together in this life as well. The story was like a puzzle in my head. As the story went on I had a full picture of you inside my mind. You were my soulmate from a past life. It's all the same. When I first saw you it felt like I knew you for a very long time. It was something in your charismatic approach to me... I was lucky enough to move space and time, stop the world for a second and share wonderful moments with you. And that's what they were. You've managed to erase everything bad and wrong in this world and make me feel alive. Moments with you are something that I treasure. You are that sparkle, that magic which makes me believe that true love really exists. You are that proof that love is a cosmic thing. You're not part of my world now, but that doesn't matter. I do love you. I love you because you're that luck which happens and when it happens you keep it safe in your heart like faith in magic. You are my miracle. 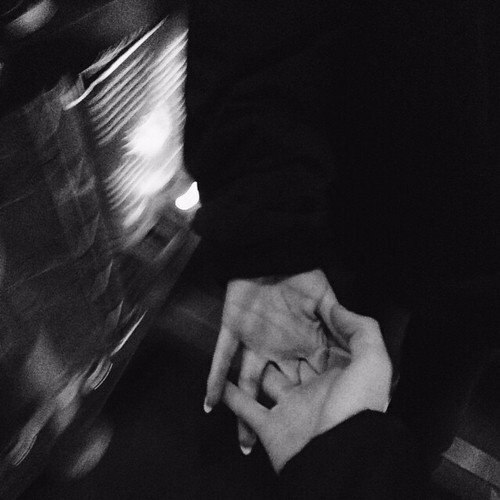 And I will always keep you safe. Because this world is bad sometimes and miracles must not be ruined. When the woman ended her story I wanted to share my story about us with her. But in that moment my heart decided to stay silent and keep you as my most valuable secret. And that's how it will remain. Thank you for being my miracle. You will always be the special one for me. One of a kind, just like love should be.